We have previously reviewed writer Andrew Maxwell’s work on “Aldous Spark: Meddler in History and Other Unsavoury Affairs”. As it evolves, Mr Maxwell has an earlier work, dating back to 2014, which we decided to read and review. 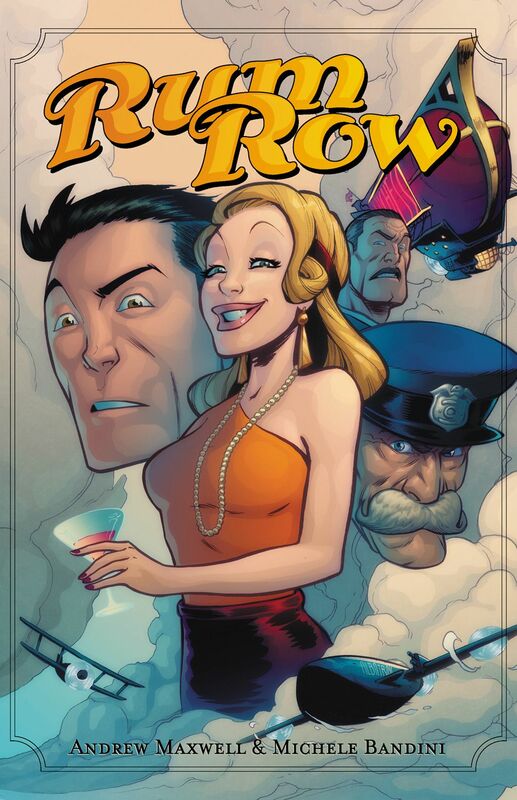 This is timely, because “Rum Row” #2 is about to undergo a fundraising exercise by way of Kickstarter. It is clear from both this title, “Rum Row”, and “Aldous Spark”, that Mr Maxwell is an aficionado of steampunk. (If he continues to be so prolific in this quite unique sub-genre, we will need to create a new category for our website.) This story is set in an alternative reality United States during the Prohibition era. Annie Blanchard is captain of an airship called “The Duchess”. It functions as a speak-easy. Despite hiding her identity and posing as an underdressed waitress, she is arrested by the FBI for violation of the Volstead Act – trafficking alcohol within US airspace. FBI dirigibles descend on “The Duchess”, and agents act quickly and brutally to shut the establishment down. A classic pusher propeller configuration aircraft (possibly a larger version of a Curtis Wright XP-55 Ascender?) drops a team of gas-masked New York Police Department agents onto the room of “The Duchess”. They affix a huge magnet to the roof and then smash through the windows of the airship’s bridge. The speak-easy is raided, in an entirely steam-punk way. Annie is lead in cuffs onto the floating flagship of the NYPD, called “The Albatross”. The plan, it seems, is to appropriate The Duchess for use by law enforcement agencies. A key exchange of dialogue follows. Annie says understands the motivation to use her airship: “She’s a beaut. Not to mention faster and more efficient than your entire fleet combined.” The Commissioner frowns a response, “There was a time, Miss Blanchard, when that statement may have held some truth. But we’ve come a long way since then. Our latest model I think you’d rather like.” The Commissioner is apparently referring to “The Albatross”. Annie seems to try and seduce her way out of the predicament by offering herself to the New York Police Commissioner. She throws her jacket off, displaying her scantily-clad curves. It is a distraction. The Commissioner taunts Annie. “Ha! And what could you offer me that I don’t already have?” he asks. “Well, there is one thing,” she says, smiling. For in the meantime, the staff and guests of “The Duchess” fight back, procuring guns from hidden locations aboard the dirigible. Annie proposes an exchange: her release for the lives of the policemen. Mr Maxwell does a fine job of characterisation with the lead character. Annie is carefree. Immediately prior to her arrest, she flings open the door of the bridge of the airship, observing the moonlit cityscape beneath her. “No one telling you what to do up here. Nothing but open sky.” Jack responds, “You’re amazing.” But further, she is cunning. The entire episode is an opportunity for Annie to procure the schematics of The Albatross. The final scene has Annie hugging the plans as if they were a newborn child. It is a highly entertaining title.